Warner Bros’ CinemaCon presentation started off with a bang tonight: a 15-minute spotlight on upcoming DC Films. 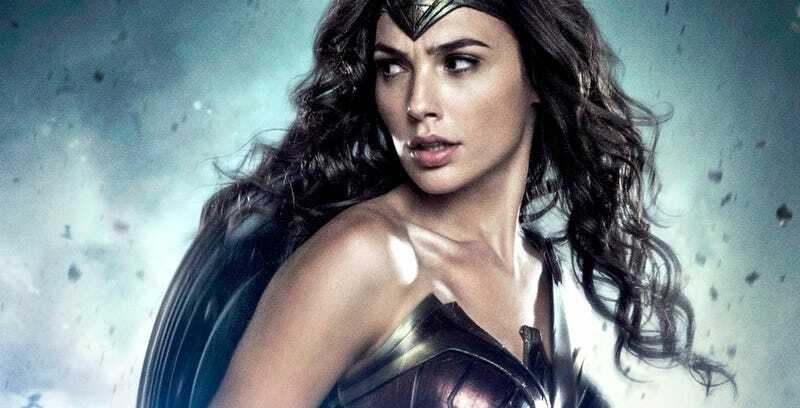 It touted the huge success of Batman v Superman (and the head of WB confirmed that Ben Affleck will be directing a solo Batman movie), showed the new trailer for Suicide Squad, and did a sizzle reel that included about 30 seconds of new Wonder Woman footage. In the footage, which was integrated into a huge reel that also had footage taken from Man of Steel, Batman v Superman, and Suicide Squad, we see her on horseback in the woods and in a field. We see Chris Pine’s character in the cockpit of an old airplane, ready to take off. We see Wonder Woman in a room fighting a group of soldiers, throwing a slow motion spin kick. She deflects a bullet off her forearms and it kills three soldiers in one shot. We also see Diana show up at a party in a bright blue dress, making her stand out among the mostly gold color scheme. The movie definitely has a similar aesthetic to Man of Steel and Batman v Superman, but the period setting—the costumes, the castles, etc.—just gives it a different feel. In voiceover, the character says that the film will tell Wonder Woman’s “entire history” and explain what her mission is. That was about it in the short amount of footage we got to see—but we’ll have more from CinemaCon soon. Directed by Patty Jenkins, Wonder Woman opens June 2, 2017.